Haha...I can totally relate to your post! Sam Woo BBQ (except for me it's the Chinatown branch) is my ULTIMATE poor man's food. Two rice plates (e.g. Bok Choy and chicken over rice) costs us under ten bucks and lasts us two meals. So much better (and cheaper!) than fast food! Is this the "express"? I think they have one in Costa Mesa across from South Coast Plaza....anyways, I like their honey walnut shrimp (13 bucks though) or their house special chow mein, crispy fried noodles! Actually it's not the "Express" per se (although they *might* call it that). Sam Woo in Irvine is actually two restaurants. One side is called Sam Woo Seafood. This is the fancier of the two. They offer seafood dishes, lunch specials, and dim sum. White tablecloths and uniformed waiters here. The other side is called Sam Woo BBQ. This is the more casual side. They specialize in noodle and rice dishes with BBQ pork, etc. This restaurant is, itself, split into two. There is the dining room on one side, and in the other, the takeout counter. In the dining room, you'd order from a waiter and a menu. 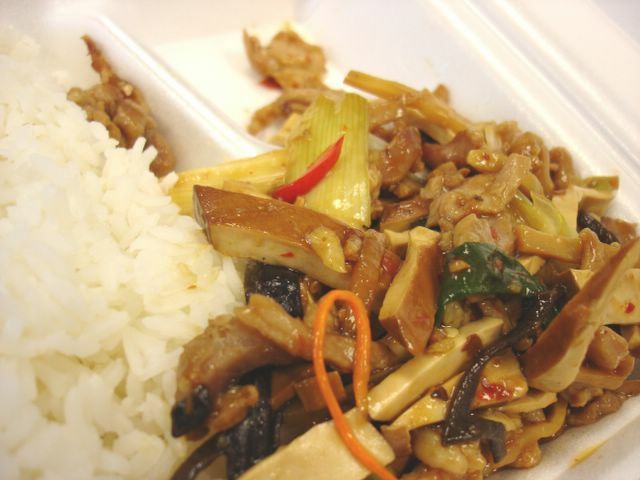 On the takeout counter, you can pick to-go items from steam trays or order from the menu. The bargain's the steam tray. The offer is one item combo at $2.95; Two at $3.95; and Three at $4.95. Pretty good stuff for the price, but understandbly, the steam tray selection is pretty limited - and you have to be careful you don't order something that looks like it's been sitting there too long. I sometimes order a noodle dish from the menu for takeout if the steam tray's not looking good. I haven't tried the Sam Woo in South Coast though. How weird! I ate dinner at the Irvine Sam Woo today (the cheaper side). It was pretty good even though I asked them not to put MSG in it. Last month, I tried that pork and pressed tofu dish and I didn't really like the tofu. It tasted like some kind of herbal medicine. Since we're on the topic of Chinese food, have you ever eaten at Jamillah Garden on Walnut near Jamboree? It's a Chinese-Muslim restaurant and it's take on Chinese food is quite nice. It's pretty good, but it was much better 2-3 years ago before it was under new ownership. I heard the same thing about that Sam Woo in South Coast. One of these days I'm probably going to try it, if not just for curiosity. I haven't tried Jamillah Garden though. I have heard good things about it, but it's a matter of dragging my friends to it, who don't like lamb and Chinese food as much as I do. It's good to know it's there though...the only other Chinese-Muslim place I know of is in Monterey Park. OH MAN...I just had the worst take-out meal from Sam Woo Express in Irvine. I take back what I said about it being a good value. The Orange Peel Chicken was so dry it felt like I was gnawing on a dog's leather chew toy. The Tofu and Pork dish was no better. The fried tofu had the texture of an old, used sponge. And I normally love tofu! The chunks of roast pork was slightly better, but the gloopy sauce was like soy slime. The Chow Mein was flavorless and cold. I should've heeded my own warning of ordering a noodle dish when the steam-trays look bad. I love Sam Woo! I usually go to the one in Cerritos on South Street. I can make a 3 item combo last for an entire week (Mr. Bachelor Lifestyle). The safe bets are the green beans, tofu, and eggplants. You should try their YING YANG Fried Rice at the regular Sam Woo. It's a ketchup lovers dream! i usually order from the menu for to go... i don't order from the steam trays cause i had experiences from it before... like the chow mein looks so flavorful but it's actually bland... the fried rice just absorbed the soy sauce... and the others...well... they're just lying there all day long. the yang chow fried rice is also good if you have it cooked to order. and their beef pan fried noodles is the bomb! even with the soaring prices of rice... their prices in the menu hasn't changed much. Good for you recycler. I love that recycling place because you've described it perfectly. I've stood in line with other people who are just as middle class as the next and they are there to do the same thing...recycle their bottles. I started having my 7 year old son recycle last year and it's one of his regular chores. He makes out great from anywhere from 9-27.00. Not bad for a youngster. Try S&W (related to Sam Woo somehow) by the Nice Time Deli and 99 Ranch in Irvine. Love love their food. My fave is the octopus appetizer. I never taste this people food, but when I'm short of money I went to chinese markets in china town because I can find cheap and delicious stuff specially vegetables.